I love it when I come across a film where you’re drawn into it with the talent involved. This was the case with “Mayhem”. The film is directed by Joe Lynch who co-directed “Chillerama” and was one of the stars of “Holliston” which is a very funny show that ran on the defunct Fear Net and is out DVD and Blu-Ray. The film also stars Steven Yeun who was one of the original cast members of “The Walking Dead” and Samara Weaving who made waves this year in Netfilx’s “The Babysitter”. The people involved made me excited for this film. The film is about a lawyer (Steven Yeun) whose day isn’t going that great. First, he was terminated from his job, then he finds out that he’s been infected with a virus and stuck there as the building is quarantined. To make matters worse, he gets locked in a room with a former client (Samara Weaving) who hates him and his former employer. He is team up with her as they extract their revenge at the law firm and settle things for good. When I first heard about the film, I thought that this was going to be like “The Belko Experiment” and that would be it. Boy, was I wrong. 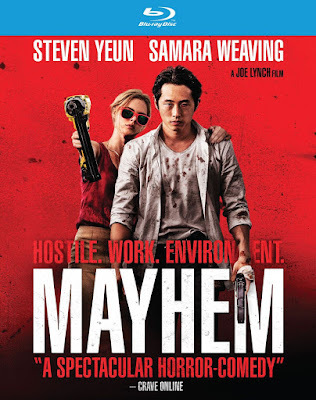 “Mayhem” had me hooked from the first minute in as it had a more of a fun tone and was completely different from that film. One of the major reasons that I liked this so much was Joe Lynch’s direction. He makes his directing so good here as the action sequences are balls to the wall bloody. He makes sure that they are presented in a way that it keeps you entertained as everything had that fun horror feel to it. It’s something that was needed as made this film one of those fun films to watch. The other thing that I liked about Lynch’s directing was the fact he manages to make the performances fit the film’s twisted tone. Whether it was making the chemistry between the actors work to making the violent scenes feel cartoonish, it made everything onscreen work which makes this films one of the better horror films of 2017. I also liked it that the film has two very good lead performances from Steven Yeun and Samara Weaving. Both of them had great chemistry with each other whether it was in the beginning of the film to all the chaos that goes on through the film. They made the dynamic between the two main characters work. It’s important for that to work because you’re invested in the characters. If that didn’t work, then it would’ve felt like any other horror film where the violence is center stage. The screenplay written Matias Caruso was very good from start to finish. One of the things that I liked about his screenplay was the way that he tells the story from the main character’s point of view. This could’ve been a film where the over the top violence were the main focus but by using the narration device, it allows the main character and the story to be the focus and not the violence. It made this a much better film than “The Belko Experiment”. The other thing that makes this good was the fact that the dark humor works so well here. It’s done in a way that you’re having a good time and not sitting there being bored as it complements the film’s twisted violence. That’s how dark humor should work. Definitely check this film out as was a very fun film from start to finish. 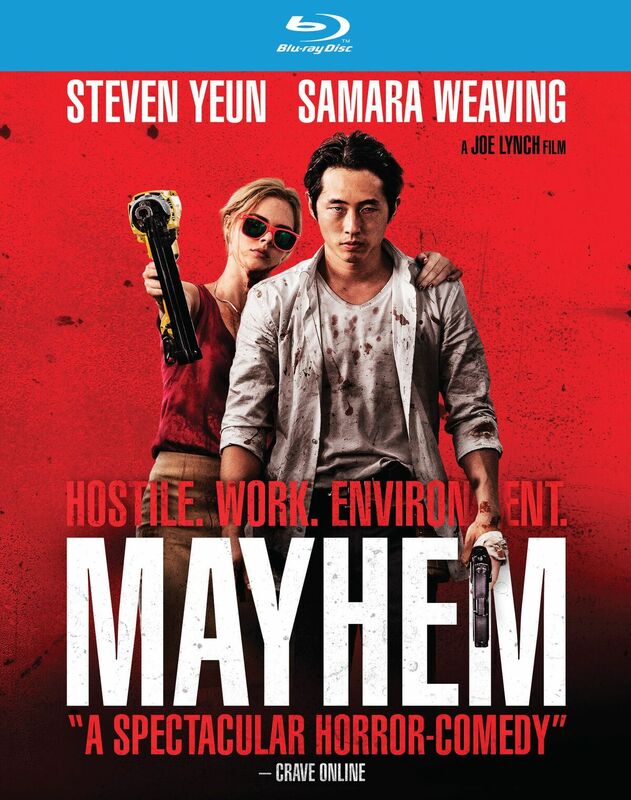 With its twisted humor and violence and its lead performances, “Mayhem” is bloody fun.